I’ve met my fair share of beet haters in my time (my husband being one of them) and I have a perfect track record of converting them once I actually get them to try something made with fresh beets. Fresh beets that have been roasted, sautéed, braised, blitzed down into puree or even made into simple chips have none of the tinny, off-putting flavor you usually find in commercially canned or pickled beets. Forget any old memory of rubbery, syrupy-sauced, canned beets that lurk in your taste buds. Fresh beets are truly beautiful and delicious. Flavor so sweet, rich, hearty and earthy, and beet varieties come in jewel tones of deep crimson, golden yellow and even candy-striped red and white roots. Many are surprised by their sweetness (so sweet you can even bake with them!) and are delighted to find out that beets are in fact overflowing with a tremendous amount of flavor. Flavors that many could not even imagine are in a simple beetroot. 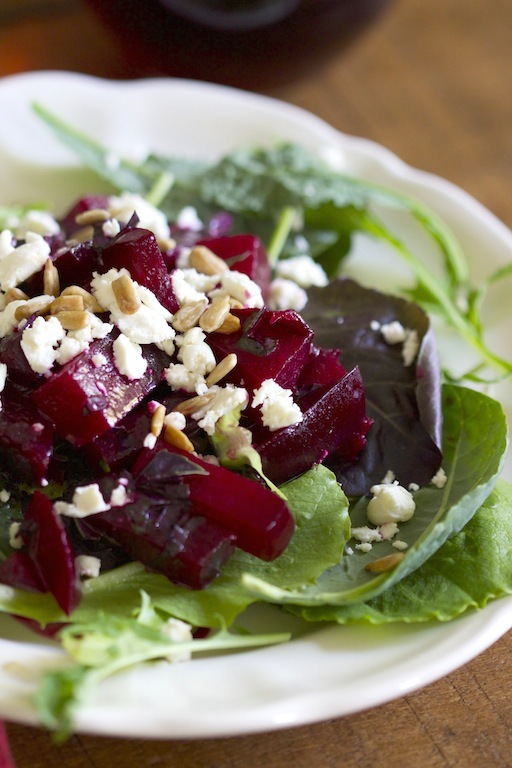 If you think you hate beets, then give this beet salad a try – I bet it will change your mind! This salad is as flavorful as it is beautiful. Preheat oven to 400 °F. Slice off the beet leaves close to the tip of the beet, leaving yourself enough to grip. Save the beet greens for another purpose or chop up and mix them in with your spring salad mix. Scrub thoroughly, place on 3 or 4 layers of foil, add salt, pepper, garlic powder, oregano and 4 tablespoons of olive oil, then wrap them loosely in foil. 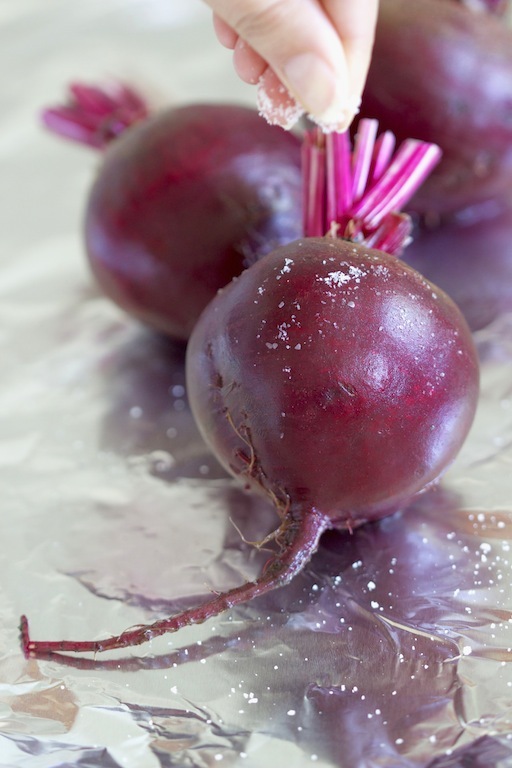 Transfer the wrapped beets to a baking sheet. Roast for 50-60 minutes. Check the beets every 20 minutes or so. Beets are done when a fork or skewer slide easily to the middle of the beet. 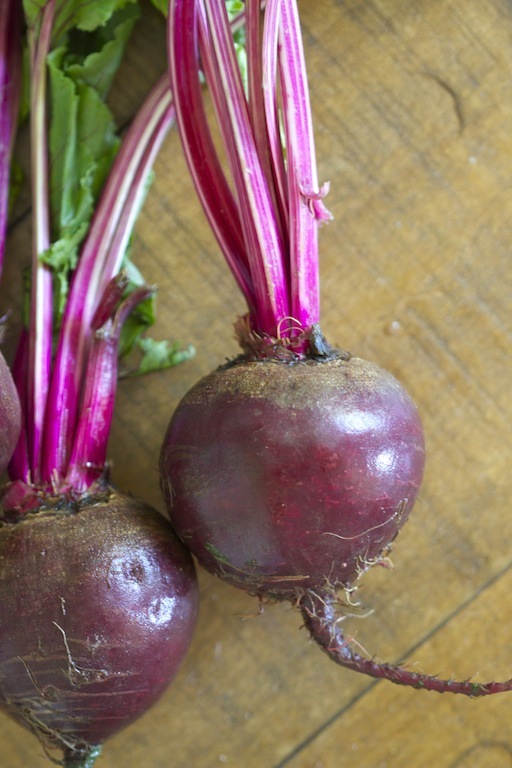 Small beets will cook more quickly than large beets. Let the beets cool enough to handle. Hold one of the beets in a paper towel and using another paper towel, scrub off the skin. The skin should peel away easily. If it doesn’t then the beets need to be cooked a little longer. As the beets are cooling make the dressing. 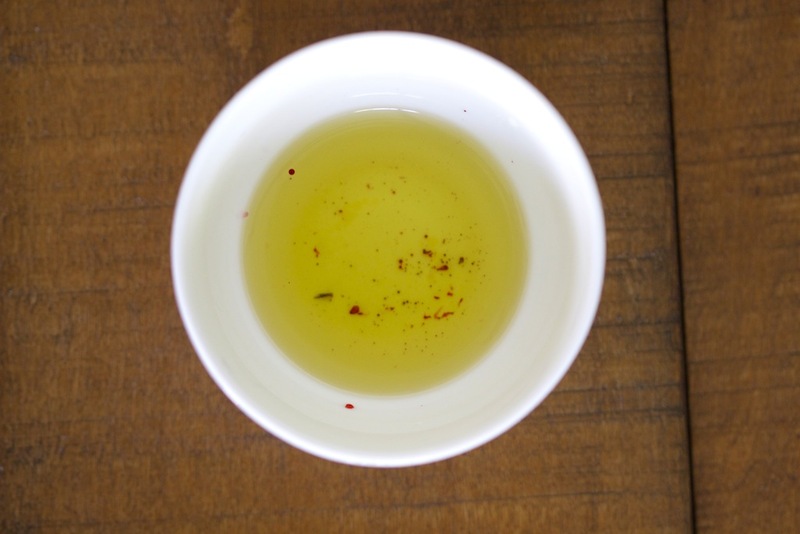 In a small mixing bowl, combine the Dijon mustard, honey, oregano and lemon juice and mix. Slowly add in the remaining olive oil from the roasted beets. Add salt and pepper to taste. Slice the beets however you like. I like them thickly julienned. Marinate the sliced beets in the dressing while you prepare the ingredients for the salad mix. In a large mixing bowl combine the spring mix, green onions, sunflower seed kernels, basil, goat cheese and dressing and mix. 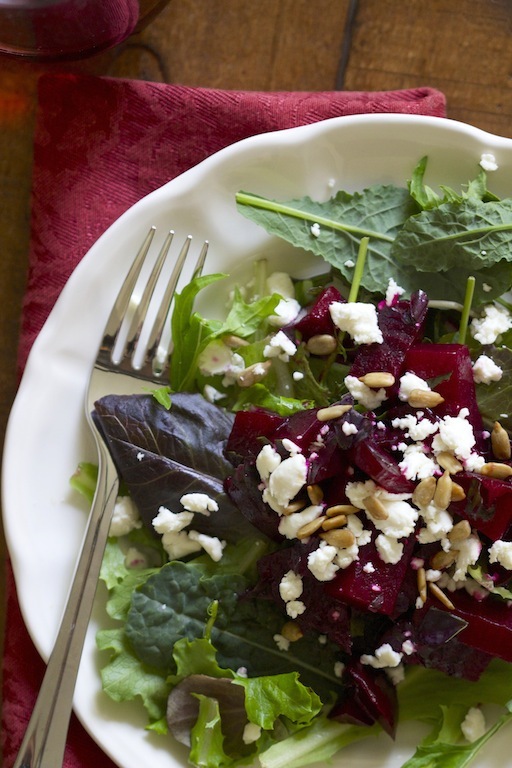 Serve salad with sliced beets on top or mixed in the salad. You never know, you might like the cheese with all the ingredients together. You won’t even think about the cheese, you just taste the enhanced flavors of the beets. Hope you will like it cheese or not! Beets in a salad are among my favorite things. Thank you, this recipe is packed with fresh and delicious flavors, thank you for checking it out! This looks amazing!! I have to make it! I love beets, especially beet chips. Did you ever see on the food channel where they pair beet chips with guacamole? It is so delicious !!! I will have to give your recipe ago sans the goat cheese. I love that you used sunflower seeds. Have you ever replaced them with walnuts for a salad? Of course! Walnuts are great too. 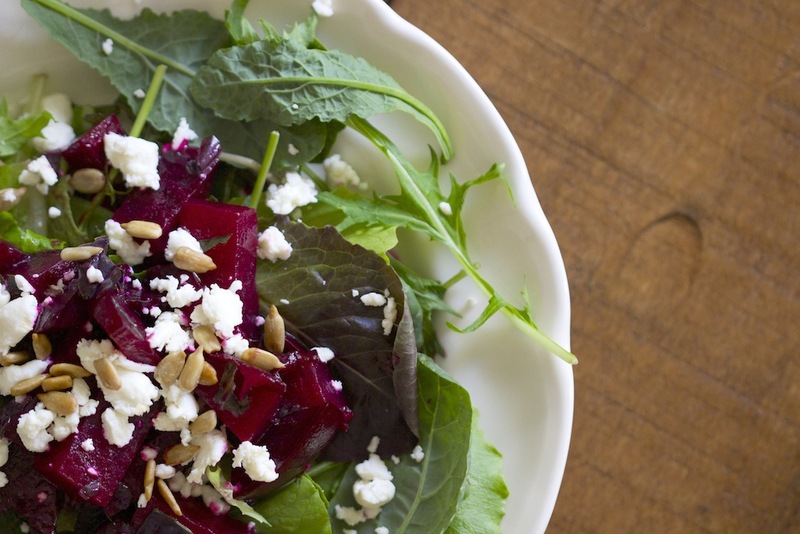 You can add pretty much anything to this salad and they will still compliment the roasted beets. I’ll definitely have to try out the beet chips sounds amazing!